Crazy for cheese? 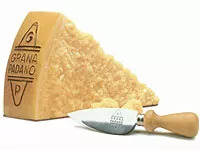 This artisanal pick adds a sweet, nutty flavor to stand-by Italian dishes—plus it’s lactose free, and low in sodium. The taste factor: A few crumbles of this sharp cheese pack a punch of nutty, buttery flavor to pastas, wraps, salads, and casseroles. Try in place of Asiago, Parmesan, or Feta. The health factor: This rich-tasting cheese goes down easy. A unique aging process keeps the cheese lactose-free, so it’s safe for even the dairy-intolerant. Plus one ounce has less than half the sodium of its Italian comrades, Parmesan and Romano. Editor’s pick: Break up a hunk into warm, whole-wheat pasta mixed with sundried tomatoes, chopped garlic, and a drizzle of olive oil for a quick and easy supper. Or melt into your next skillet of scrambled eggs with roasted peppers and onions for a sharp finish. Why we love it: A lactose-free alternative to indulgent Italian cheeses that’s low in sodium too? Say yes to this cheese, please!